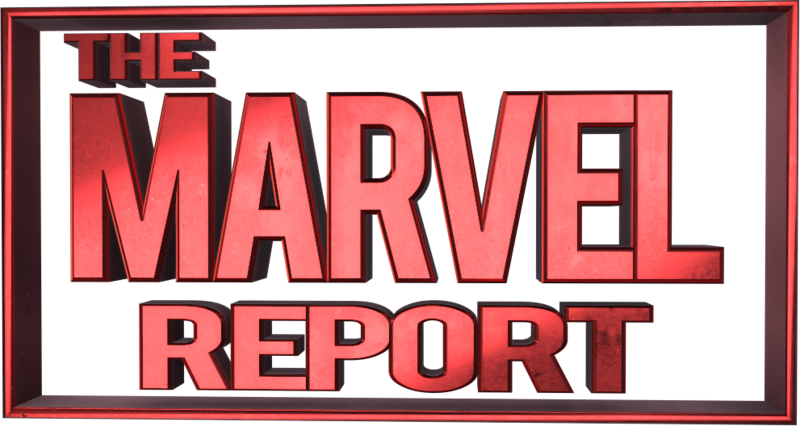 Despite everything that has been happening in Duggan’s All New Guardians of the Galaxy – they are friends who love each other. 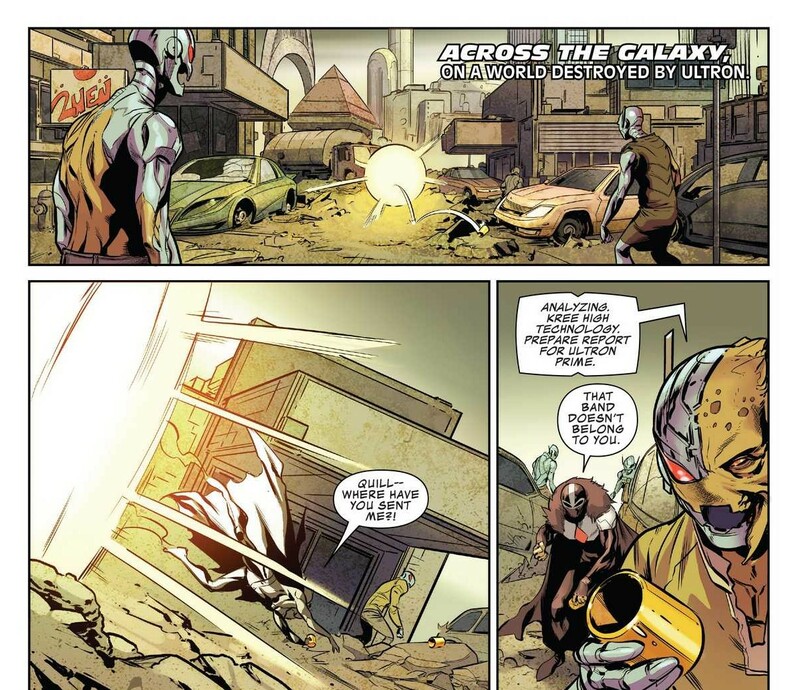 With Rocket’s life on the line, Star-Lord will do anything in his power to help. The Raptors have poisoned Rocket. What can Star-Lord do but be a hero? He has a Nega-Band and he will do anything to save Rocket. Naturally, Star-Lord embarks on a one man mission to the Raptors ship in search of an antidote. Once on the ship, he fights a mysterious figure known as Talonar of the Fraternity of Raptors. Each of them has one Nega-Band and each of them will gladly fight for the other. Outside of Star-Lords’ battle is moments between the Guardians and Rocket. They show the Guardians sharing the bond that has been so greatly missed this run. 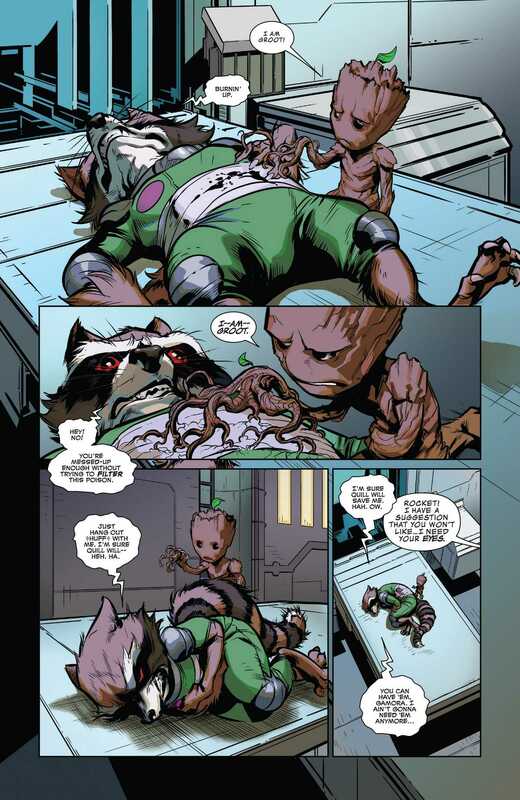 All the secrets and mysteries are thrown aside for one brief second – they all just care about Rocket. Especially best buds Rocket and Groot. Peter manages to get the antidote at the loss of the Nega-Bands. He makes sure to leave Talonar with a challenge in keeping them both. Making it back just in time, Rocket is safe and things are okay for now. Each week Duggan proves his talent at handling these characters. More importantly, each week he delivers. Duggan manages to take an experience that seems horrid to go through and keep it humorous. Yes, there are moments of fear and sadness but overall Duggan weaves in humor throughout the tension. However, what is the most notable in this issue is the way in which Duggan writes these characters. They have all been going through this tremendous journey haunted by secrets and mysteries. Yet, Duggan only lets them have one thing on their mind – Rocket. 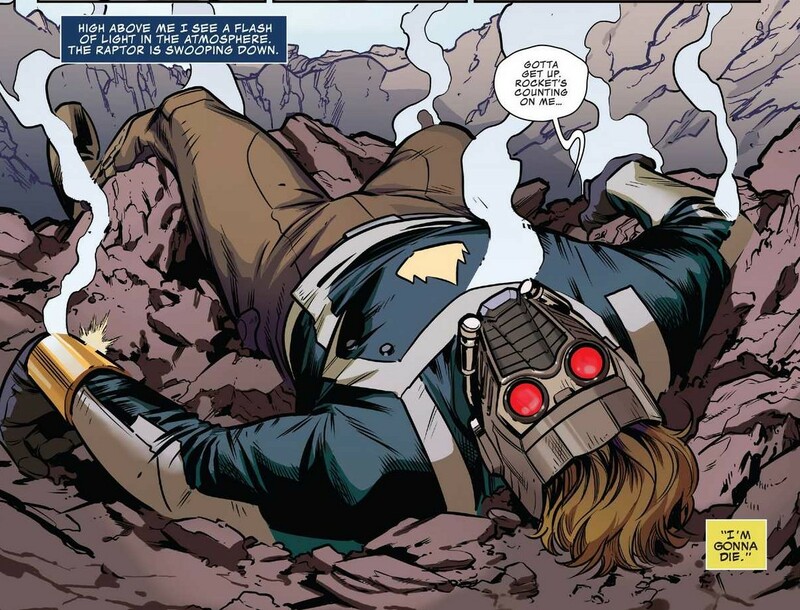 It is a breath of fresh air to watch Star-Lord risk the Nega-Bands to save a friend. To have Gamora hold Rocket in a baby carrier after fixing the engine. The Groot plot continues to be hinted but throughout we get to see them be friends again. Duggan beautifully showcases his talent at writing team led stories. A nice touch in the exterior shots is all the different landscapes that the art explores – Quill’s ship, the Raptor ship, a deserted planetoid and a world destroyed by Ultron. Each paired up with brilliant colors done by Ive Svorcina. With the planetoid, Svorcine enhances it by blues and grays, a nice contrast against Peter’s suit. Similarly, the last planet has colors that truly showcase the nature of this planet after Ultron. Truly looking like an old deserted town in a western. 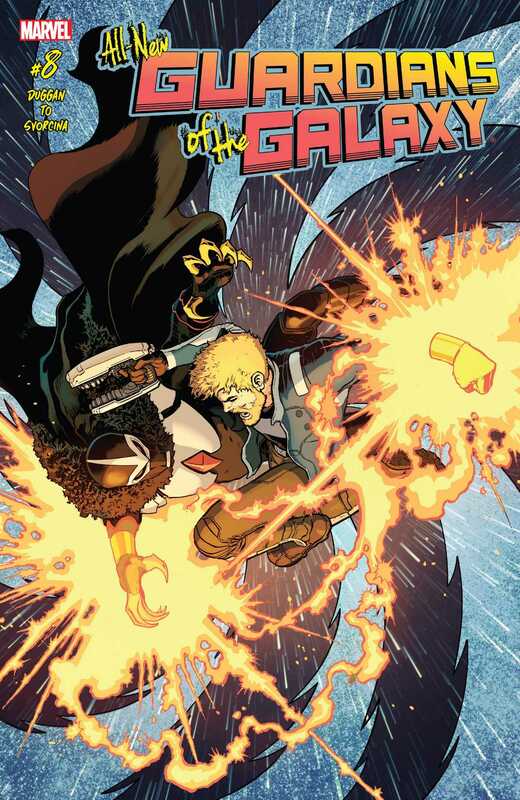 Overall, All New Guardians continues to be extremely worth the pickup. Duggan creates heartfelt moments between these characters we all know and love. Something that has been missing for quite a while on this run. Each character is written beautifully – somehow maintaining to be both sad and funny. The art done by To and Svorcina is engaging and fun to look at. In the end, this is a beautifully done team story between these characters and everyone involved with this issue.